The Everest Base Camp trek starts at the Phakding village and follows the Dudh Kosi river valley which climbs up to the Sherpa capital of Namche bazaar that's a junction for trekkers, the local Sherpa and expeditions en route to the mighty Mt. Everest . Villages are interspersed with magnificent forests of rhododendron, magnolia and giant firs. In both the early autumn and late spring, the flowers on this portion of the trek make it the kind of walk you will remember for a long, long time. We trek along a high traversing path where we have our first good views of Everest and then head towards Thyangboche Monastery, which is a 2 hour climb. The monastery sits at 3867m in a clearing surrounded by dwarf firs and rhododendrons. The monastery is structurally located on a ridge top with commanding views of the Everest landscape. The view from this spot, seen to best advantage in the morning, is absolutely mesmerizing and stunningand is rightly deemed to be one of the most magnificent in the world. We then descend to the Imja Khola and continue to the villages of Pangboche and Pheriche before finally approaching the Khumbu Glacier. We then follow the glacier, first to Lobuche, advantage point for some spectacular views of the 'Ama Dablam, Taweche and other peaks and then hike to Gorak Shep for a breather. We also have the opportunity to ascend Kala Pattar from where we can get some awesome views of the Himalayan giants which literally numb your senses with breathless admiration that beholds the eye; and makes up for the lung-bursting climb that took you up there. You soon realize it was absolutely worth it. This also includes fantastic views of the south west face of the Mt. Everest . We then trek down to Everest Base Camp at the foot of the Khumbu ice fall before finally making our way back down to Lukla. 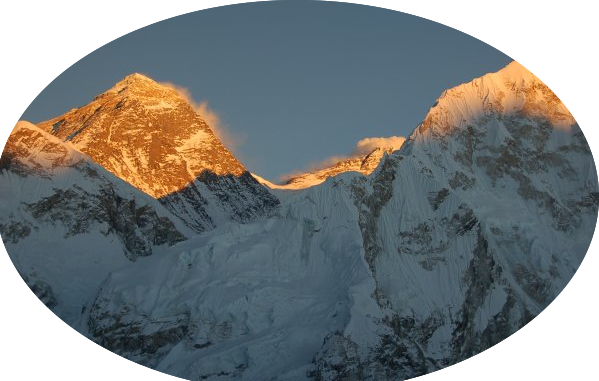 Mount Everest Base Camp has been a popular destination for trekkers since the very first expeditions to the Nepalese side of Everest in the 1953. To reach this part of the Himalaya within a limited time, we have devised this two week trek to Everest Base Camp which runs directly to and from Lukla. Longer treks going right into high mountain country, to some of the famous mountaineering Base Camps over high passes. Physically quite tiring, involves approx 6-8 hours trekking along rocky ridges of high Himalayan peaks. No previous experience is required, you should be moderately fit, used to some regular exercise and enjoy walking in the high altitude conditions.